There’s nothing better than walking into a perfectly cooled building in the height of summer. Your customers and employees no doubt appreciate the relief from the heat, but they certainly won’t enjoy unusual smells in the air. Several odours can come from your air conditioning unit, and they each indicate a different problem. By identifying the smell, you can call your aircon maintenance professional to have the problem fixed so you and your customers can enjoy the quality air. One of the primary jobs of an air conditioner is to dehumidify the air before pushing it into your commercial building. Because the unit deals with humidity and moisture, it’s not uncommon for your air conditioner to become a home to mould and mildew. These unwelcome aircon dwellers can grow on your filter as well as within your unit, so it’s best to call an aircon maintenance professional to have your air conditioner cleaned and checked for signs of mould. A burning odour will usually make you think of overheated electrical wires. Air conditioners work because of a number of internal components like fans and motors that can become overheated if they’re not functioning properly. Mechanical failure or loose wire connections could be the culprit of a burning odour in the air, but it’ll take an expert eye to find out what exactly is causing the problem. If you smell a burning odour coming from your commercial unit, call an HVAC professional to diagnose the problem. Rotten eggs might be the odour that can most affect your business, so you’ll want to take care of it right away. The smell of rotten eggs can indicate a natural gas leak, which can potentially be dangerous. Evacuate your building of all employees or customers and open windows if you can. Call your gas company and your aircon maintenance expert to remedy the problem. Whether you run a retail store or an office building, you don’t want your space to smell like someone has taken their shoes off. If an odour of dirty socks has infiltrated your building, it could suggest an issue with stagnant water. When water doesn’t drain properly from your unit, it can get stuck and begin to smell. Aircon maintenance that’ll clear the water and enable future moisture to drain properly should eliminate the problem and leave your air smelling fresh and clean. 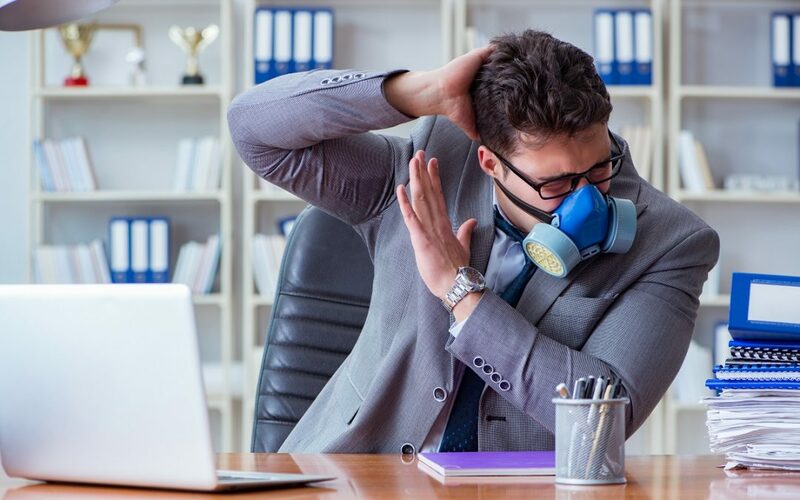 You’ve installed air conditioning in your commercial building to keep your employees and customers comfortable, but no one is comfortable if there’s an unpleasant scent in the air. The best way to prevent any odour issues arising is to schedule regular aircon maintenance by a trusted professional. An air conditioning technician will be able to catch problems early, clean the filter and ensure your unit continues to run correctly for you and your building occupants. While it may be tempting to skip maintenance or take care of small repairs yourself, it might hurt more than it helps. Air conditioners depend on each part working as it should, so one small mistake could seriously compromise the function of your machine. So if you suspect a problem with your aircon, it’s time to call a seasoned professional. Apex Airconditioning can develop customised preventative maintenance that will improve your unit’s lifespan, reliability and energy efficiency. Regular maintenance will help maintain your air quality so that your employees and customers are always cool and comfortable. Our technicians have trusted industry experience, superior technical abilities and great customer relation skills, so you know your unit is being serviced by the best. Have you ever had a bad smell come out of your air conditioning vent? Did it turn out to be one of the odours mentioned above? Contact Apex Airconditioning today to learn more about how we can help you.